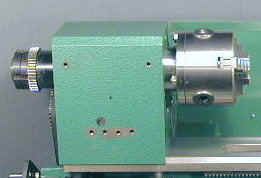 This page describes the construction and features of the 7x10 mini lathe. 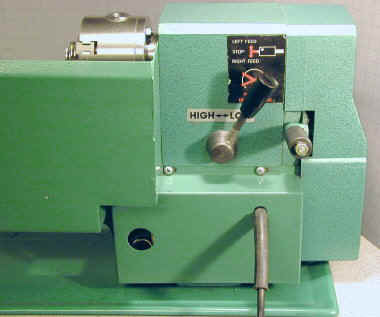 The specific model described is the Harbor Freight 7x10, but most of the information applies to similar lathes sold by other vendors including Enco, Micro-Mark, Northern Tool, Homier, Grizzly and others. See the Versions page for lots more info on the various models available. There are differences in the power supplies and other features. Newer or older models may also differ in some respects from the specific model described here. This little lathe has a lot of potential but has some shortcomings that you should be aware of before you decide to buy one, as you will learn in the following sections. Fortunately, there is now a great deal of information available on this lathe on the web, so you are not on your own if you encounter a problem. One of the best sources of information is the 7x10 interest group. Having owned an Emco Maximat lathe/mill in the seventies and having a little more spare time now that my kids are grown, I was in the market for a small lathe in Fall of 1999. After searching the web and looking at various options, I purchased the Harbor Freight 7x10 mini lathe. It is sold under the Central Machinery brand name and is Harbor Freight SKU# 33684. This lathe is made in China, and has a lot of rough edges (literally and figuratively) out of the box. However, most of its flaws are fixable and if you spend some time improving it, you can end up with a very capable and reasonably precise little lathe. This is a very sound approach if you need a lathe with more beef than the high-quality US-made Sherline or Taig micro-lathes, but can't afford or justify spending $1500 or more for a high-quality minilathe such as the Prazi, Sakai or Emco. (Note 02/20/02 the Sakai company went out of business recently and these lathes are no longer manufactured). Some owners have described it as more like buying a kit of parts which you then refine into a finished working tool. Many owners, myself included, find the process of improving the lathe to be as much fun as making the other stuff which we bought it for in the first place. If you need to get right to work, or just don't want to spend your time fixing up a lathe, consider instead the excellent machines offered by Taig and Sherline. The Harbor Freight 7x10 sells for $399 but sometimes goes on sale for $349 or even as low as $329. At that price, it is a lot of bang for the buck! It weighs about 80lbs - light enough for one person to move it easily, but heavy enough to turn some serious (by home shop standards) metal. Harbor Freight also includes free shipping and even pays return shipping if you need to return something. Other companies charge $40-50 for shipping and a heavy item may cost you another $40 if you need to return it for some reason, so this is a valuable service. Several vendors, such as Grizzly, Micro-Mark, Enco and others now sell variations of this lathe with different features, so choosing the best model for your needs is becoming a little more complicated that it was when I bought mine. To help you with this process see my mini-lathe versions page. To gain a good understanding of the lathe, you will need to know the names of the various components, as illustrated below. The carriage, in the circled area, consists of the apron, the vertical casting on which the carriage handwheel is mounted, and the saddle (not shown), the H-shaped casting that rides on the ways to which the apron is attached. 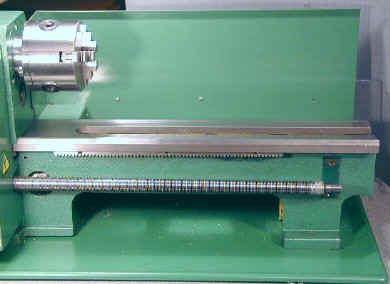 In the photo below, the carriage and tailstock have been removed to show the basic construction of the lathe. This is the 7x10 model. The 7x12, despite it's designation, is actually 4 inches longer. The bed is a single sturdy casting with cross braces. Attached to the base of the bed is a sheet metal chip tray. 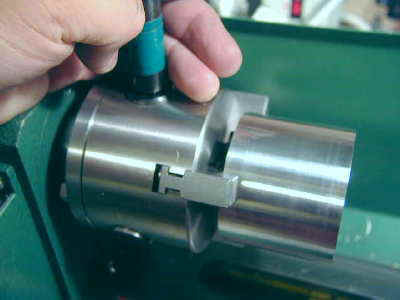 A sheet metal chip/splash guard runs behind chuck and along the back of the lathe. Varmint Al did not like these and removed them, but I find them pretty helpful in keeping chips under control. Well, come to think of it, the chips get all over the shop anyway, and the tray does have a way of getting small bolts, taps, drills, etc. hidden under its edge. Four rubber feet are mounted on the bottom of the lathe under the chip tray. I removed these and bolted the lathe directly to my workbench after retapping the metric threads to 1/4-20. Here's a view of the back of the lathe, showing the chip guard, motor cover and control levers. The headstock comprises the rectangular metal casting at the left end of the lathe. It contains the spindle shaft and its support bearings and the Hi/Lo speed shift lever and gears. Normally, the headstock is mostly hidden behind the electronics box and the spindle is hidden by the gear cover. In the following photo these have been removed to reveal the headstock casting and spindle shaft. Instructions for removing and lubricating the headstock can be found on the Tuning page. There is a knurled spring-loaded sleeve on the lever which must be pulled back with considerable force to move the lever from one position to another. A locking pin engages with detents in the headstock casting to hold the lever in place. This is not a very robust design and has caused minor troubles for some users when the tumbler gears did not engage or disengage fully. Tumbler gears are an unexpected feature on such a low cost lathe. They allow you to reverse the direction of the leadscrew relative to the direction of spindle rotation. Note that this is not the same as merely reversing the spindle direction, which would also reverse the leadscrew rotation. The most common use of this feature is in cutting left-handed threads. The Hi/Lo speed lever selects the spindle speed range by engaging different gear ratios within the headstock. In Lo range, the speed range is approximately 150 to 1500 RPM and in Hi range, 460 to 2900 RPM - at least that's what's marked on the speed control knob legend. 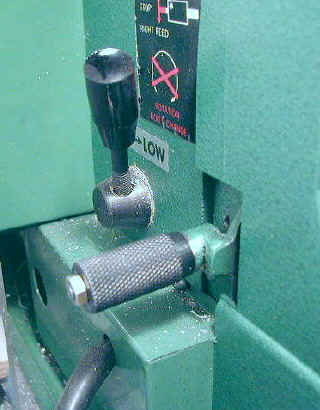 The Hi/Lo speed control lever should never be shifted when the lathe is moving and this fact is clearly marked on warning labels on the lathe. Many 7x10 users recommend opening up the headstock and lubricating the gears and shift mechanism with white lithium grease. On mine, I was compelled to do this when the shift lever seized up after a few months of use. A good workover with grease solved the problem and made the lathe run a little quieter. Opening up the headstock is probably best left until you are comfortable with other maintenance operations on the lathe. 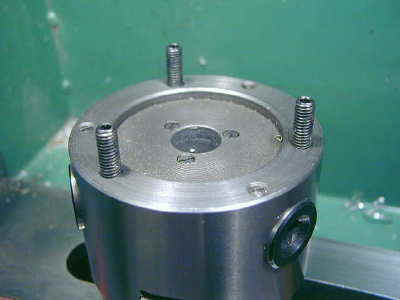 The spindle is the main rotating shaft on which the chuck is mounted. It is supported by precision thrust bearings mounted in the headstock casting and is driven by a toothed pulley and belt which runs down to a smaller toothed pulley on the motor. The spindle plate is 3" in diameter and has a raised lip which mates with a recess in the back of the chuck, providing precise centering of the chuck. The spindle bore is a #3 Morse Taper so you can purchase and use any standard MT3 accessories such as live or dead centers. A nice feature of the 7x10 is that it has a relatively large through-the-spindle diameter of 3/4"; bigger than you might expect for a lathe of this size. This bore can be safely reamed to 13/16" to provide a little additional clearance. Note that there are 6 mounting holes in the spindle. The extra mounting holes mate directly with the 3" 4-jaw chuck - a great accessory. Some older models of the 7x10 and the HF 39916 cam-lock tailstock model, are lacking these extra mounting holes. Three 6mm studs are threaded into the back of the chuck. 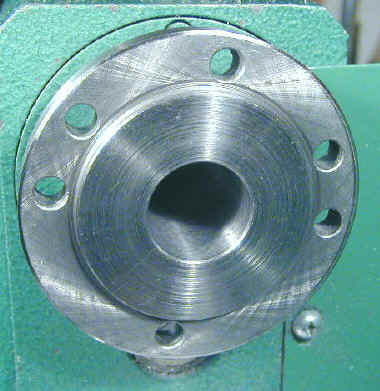 The chuck is mounted the lathe spindle by mating these studs with holes in the lathe spindle plate and then securing it with 3 nuts from the backside of the spindle plate. There's very little clearance behind the plate, so this is one of the more challenging setup operations on the lathe. Here are some hints on how to work around this. Before removing the chuck for the first time, you may want to make a mark on the edge of the spindle plate and a corresponding mark on the edge of the chuck. This will enable you to reinstall the chuck in the same orientation in which it came from the factory. This is not critical, but may help you gain a little extra accuracy. Both outside and inside jaws come with the chuck. The maximum diameter you can safely hold with the inside jaws is about 1.25"; with the outside jaws it is about 2.5". 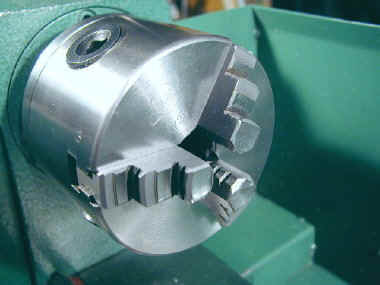 This photo shows the outside jaws and the chuck key. For maximum accuracy, it is a good idea to always mount each jaw in the same slot that it originally was in. Before removing the jaws from the chuck the first time, assign an arbitrary number to each jaw and mark the jaw and its slot with a Sharpie pen. After removing the jaws, look closely at the slots on the sides of the jaws and you will see that they are numbered from the factory. 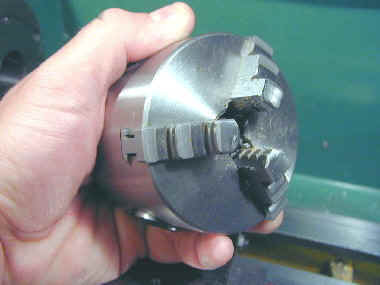 Use a center punch to make 1, 2 or 3 dots on the chuck slot corresponding to the factory numbering of the jaws. When reinstalling the jaws, you must always follow the factory numbering sequence. 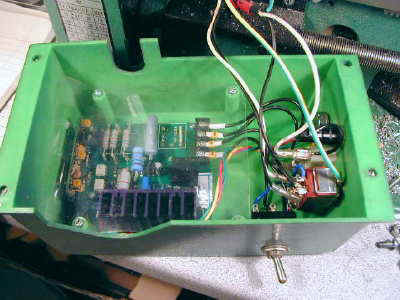 The speed control electronics are on a circuit board inside the plastic housing on which the power switches and speed control knob are mounted. A red plastic rocker switch with an integral pilot light controls the main AC power to the lathe. 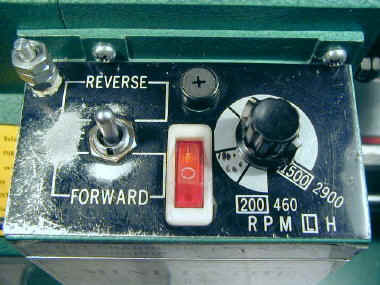 A metal 3-position toggle switch controls the direction of spindle rotation; the middle position cuts off power to the motor while maintaining power to the speed control circuitry. It's good practice to use the middle position of this switch, rather than the red power switch, to stop the motor when you are working since the red power switch will induce a 'surge' to the speed control board each time it is powered on. Over time, this surge can potentially shorten the life of the electronics and cause a failure of the speed control board. Use the red power switch to power off the lathe at the end of the day. Speed is controlled by the small black knob; this can be done while the lathe is running, which is a really nice feature. In Lo range, the speed range is approximately 150 to 1500 RPM and in Hi range, 460 to 2900 RPM. Two modifications described on my mods page are a forward/reverse interlock switch (visible on the left side of the control box on my lathe) and a way to reduce the default motor speed for better control during tapping, centering and threading operations. Note: (10/01) the more advanced power supply on the Grizzly 7x12 and the newer 7x10s make these mods unnecessary. Here's a view inside the back of the speed control box. The switch on the side of the box is the forward/reverse interlock I added. A clear plastic sheet helps to prevent metal chips from getting into the circuit board a wreaking havoc. Several owners have found, though, that this is not enough and have had the board short out. The leadscrew makes a nice little chip conveyor and passes right through the electronics box. Because of this risk, some owners have moved the electronics into separate box mounted above the headstock. 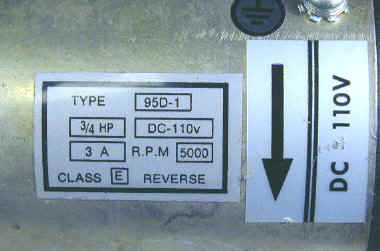 A brush-type DC motor labeled as 3/4 HP 110V powers the lathe via a continuously variable electronic speed control. This variable speed feature is one of the greatest features of the 7x10 since it allows you to adjust speed instantly, even while turning a workpiece, without the hassle of pulleys and belts used on many low cost machines. A toothed belt conveys power from the motor shaft to the lower of two shafts in the headstock. Gears on this shaft engage with gears on the upper spindle shaft to drive the spindle. The HI/LO lever changes the gears within the headstock to change the speed and torque of the spindle. 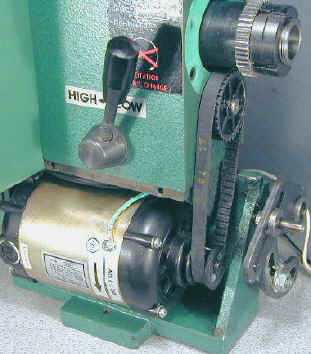 The motor's 3/4 HP rating is suspect, but the motor has adequate power and torque for all but the most demanding operations you are likely to perform on a small lathe like this. It's not hard to stall the motor, though, when making a parting cut or attempting to turn a workpiece 3" or more in diameter. If you do stall it, switch the toggle switch to the neutral position quickly to avoid blowing the power supply fuse. Although I have stalled my lathe many times, I have never blown a fuse, but I have heard reports from others that this can happen. The fuse holder is visible just above the red power switch. The fuse is a 250V 3amp mini glass fuse which is available at Radio Shack.